It is Day 5 of the Children's STEAM Festival and today we are wrapping things up by examining how MATH fits into STEAM. For those of you who have been enjoying my "Glimpse of the Garden" posts, this will serve as the post for Week 13. 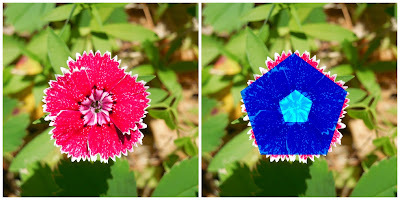 We'll investigate some math principles that express themselves in some of the flowers blooming in my yard this week! 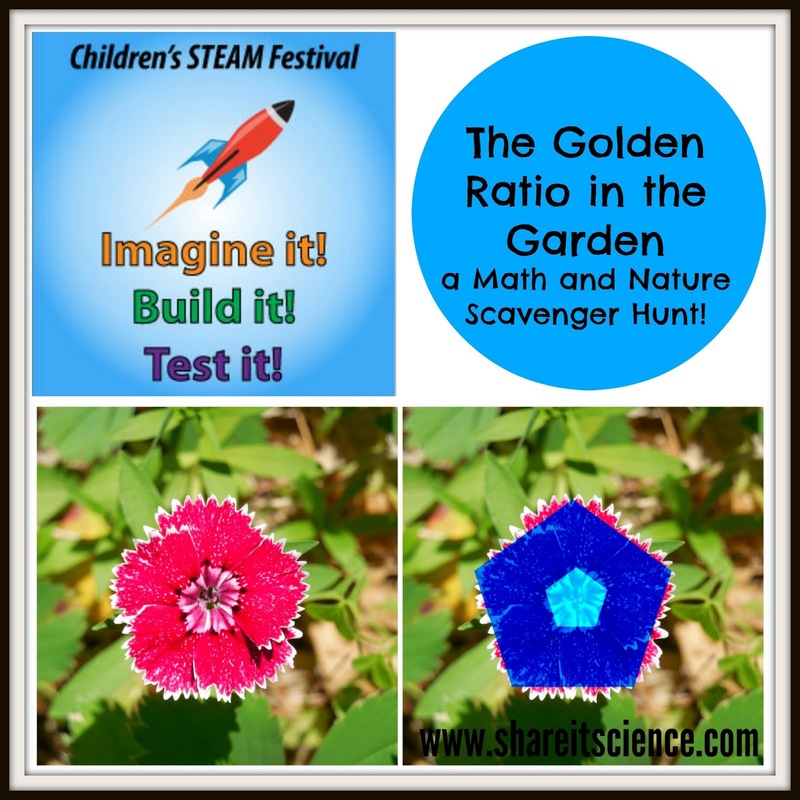 Once you have learned all about the Golden Ratio in the garden, head over to Growing with Science where Roberta is focusing on three books in the "You Do the Math" series: "Solve a Crime", "Fly a Jet Fighter" and "Launch a Rocket into Space". What is the golden ratio? 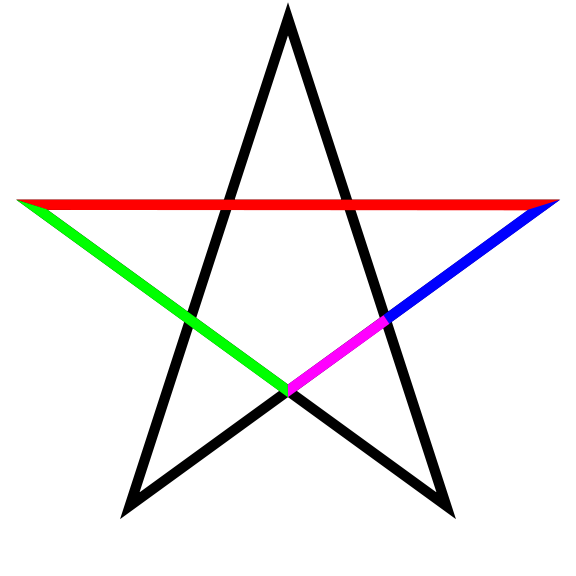 It has many names: golden ratio, golden section, golden mean, divine proportion, etc. It has been called many things by different groups of people as it has been discovered and rediscovered throughout our history. 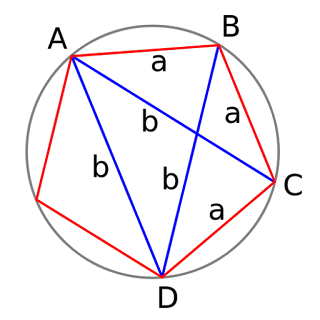 The golden ratio, or phi, can be found in nature and in human construction. So how do we find the golden ratio mathematically? 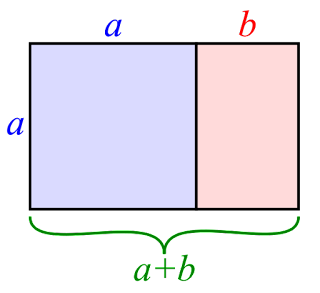 Two numbers are in the golden ratio if: their ratio is the same as the ratio of the numbers added together to the larger of the two numbers, or put more clearly: a/b = (a+b)/a. For example if our numbers are a= 8, b= 5 then we have 8/5 = (8+5)/8, or 1.6 = 1.625. The larger the numbers, the more closely they equal 1.168. Mathematicians generally use the number 1.168 to represent the golden ratio. Phi is similar to pi, 3.14, (the ratio of the circumference of a circle to its diameter) in the respect that the digits theoretically go on forever. The Fibonacci sequence is a series of numbers that relate to the golden ratio in the respect that any two successive numbers' ratio is equal to the golden ratio. 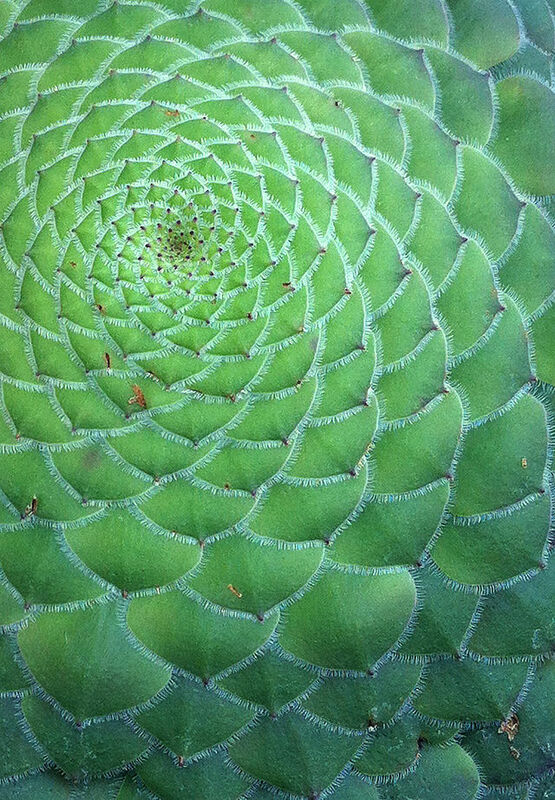 We see numbers in the Fibonacci sequence, and the Fibonacci spiral, or golden spiral all over nature. 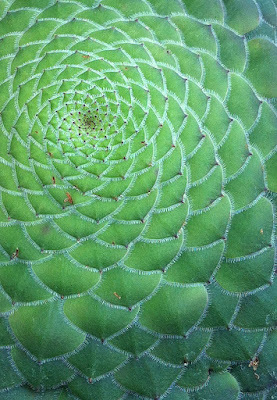 Here is another video to help us visualize the golden ratio and the Fibonacci sequence and spiral in nature. 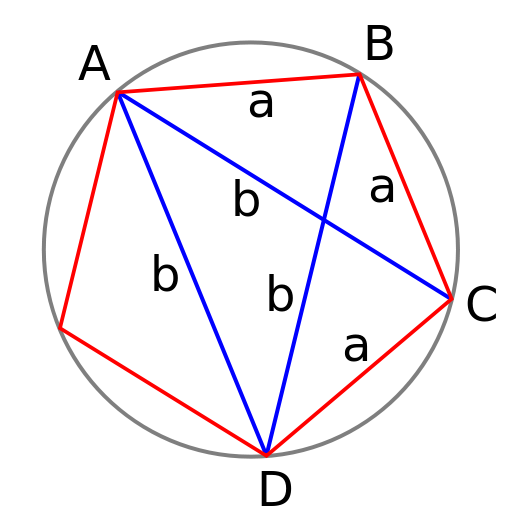 The pentagram and pentagon shapes also hold the golden ratio. Let's go on a garden scavenger hunt to find these shapes in the garden! These proportions can also be found in seashells, pine cones, stems of plants, trees, etc. Where else can you find them? 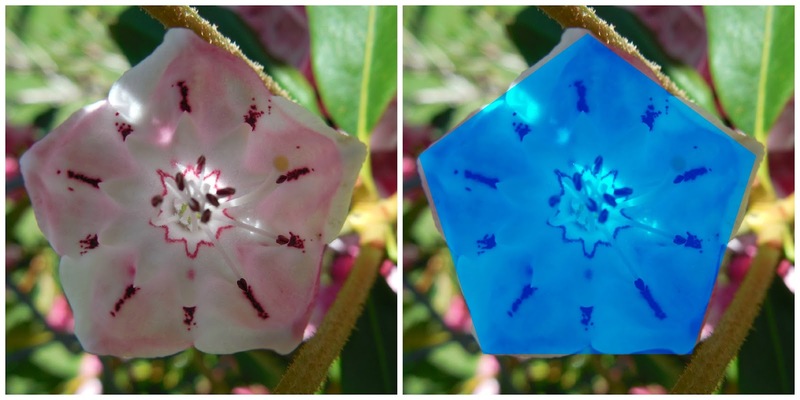 What other shapes can you find in nature? Triangles, hearts, circles? Next time you are out for a walk or hike play the shape scavenger hunt game. You'll be surprised at what you find! Thanks for exploring math in the garden with me today and for joining us for our Children's STEAM Festival! I'd love to hear how you use these ideas. Be sure to post a comment below! To review our schedule and find links to all of the festival posts, click the Children's STEAM Festival button below. 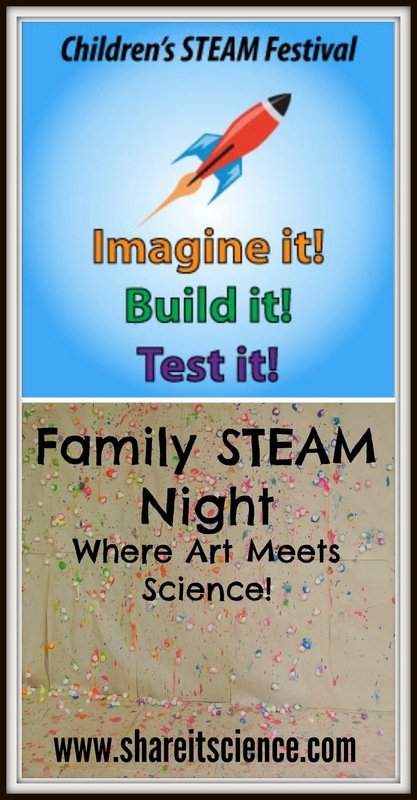 Children's STEAM Festival: Family STEAM Night- Where Art Meets Science! It is Day 4 of the Children's STEAM Festival and today we are taking a closer look at how ART enhances STEM education. Read on for some great art projects featured at my school's Family STEAM Night. Then head on over to Growing with Science where Roberta has a String Theory art project for you! It has recently become more common to add the "A", or art, to STEM education to make it STEAM education. It is not only a popular trend in education, but it also makes a lot of sense! The world is not sectioned off into subject specific experiences! Learning all of these skills together engages the whole brain and develops skills that are transferable to many educational and career-related areas. For a stunning visual on teaching STEAM vs. STEM, visit this site. This post contains affiliate links, see disclosures for more details. For the past few years we have hosted a Family Science Night in February at Pine Cobble School. We focus our family activities around a theme and this year it was STEAM. Each activity had some combination of science, technology, engineering, art or math. It was a big hit and I am excited to share the activities with you today. Catapult painting was an idea I had read about and thought it sounded incredibly fun. Despite the fun factor, I admittedly was hesitant to do this activity, particularly as we would be inside due to frigid temperatures. I was convinced otherwise. Although I would highly recommend doing it outside instead, it was a great project. 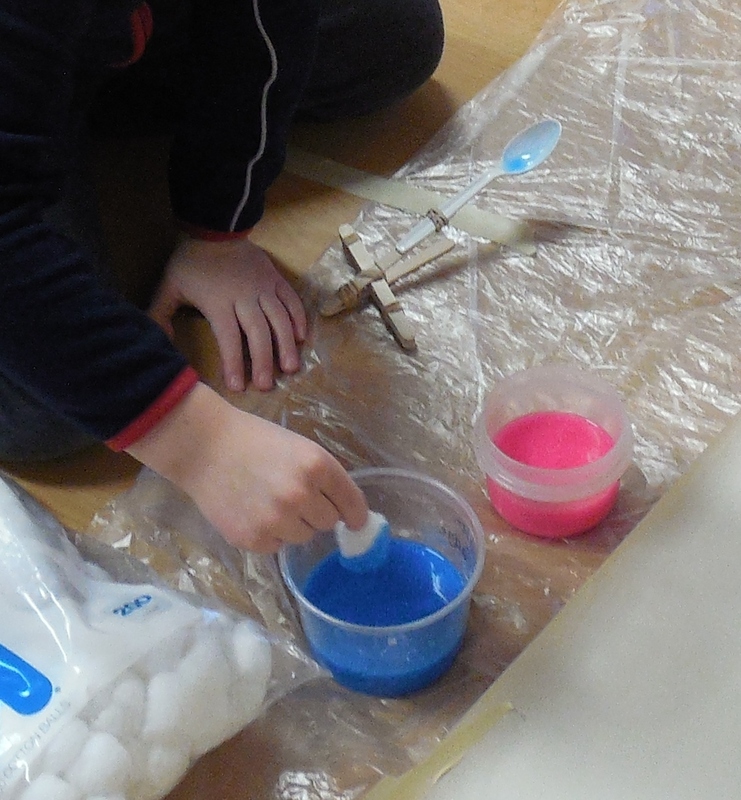 We provided craft sticks, plastic spoons, rubber bands, masking tape and dixie cups. We printed a few pictures of catapults out and then left it up to families to determine how they would build their device. Cotton balls and washable tempera paint served as the "ammunition". This was not only an interesting engineering project, but it also resulted in a modern art mural! 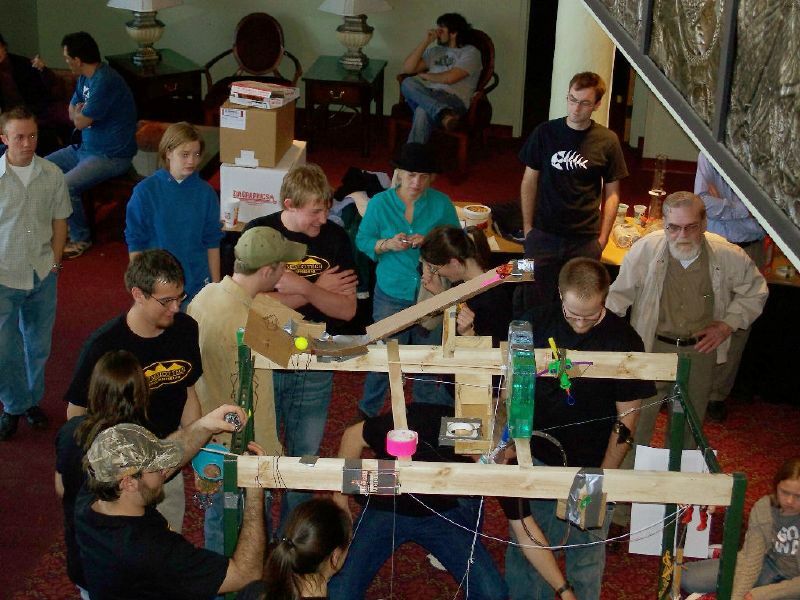 If I were to do this with a smaller group of kids, or in a different situation, I would leave the catapult building open-ended, but guide the experimenting with some questions. What happens when you launch from the ground vs the air? How can you modify your catapult to make the cotton ball travel farther? What shape is the path of the cotton ball when it flies? If you use just a spoon as a catapult, where is the fulcrum? What else could we use to shoot paint besides cotton balls? For some links to great catapult building designs for kids check out this post at Fun-a-day.com. 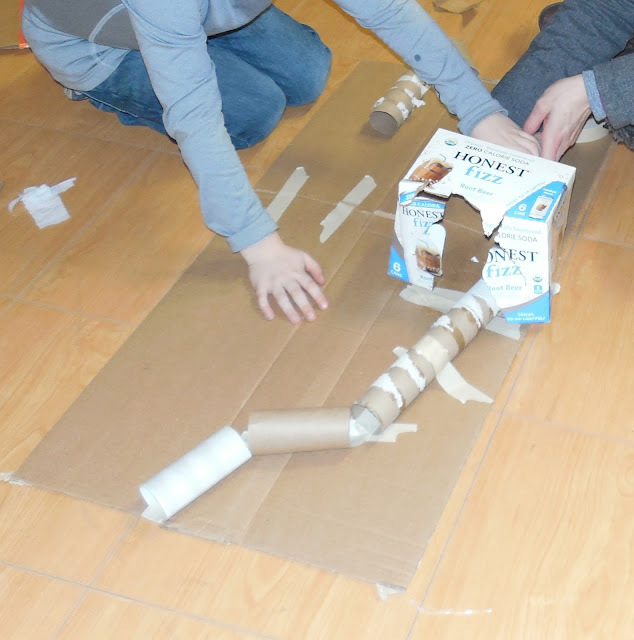 Building marble runs and marble roller coasters is always a popular activity with kids and adults alike. This is an excellent engineering project, as it involves design and lots of trial and error, in addition to being a sculpture project! We collected recyclables from the school community in advance of our event. We had boxes, cardboard tubes, plastic tubs and more. We did not accept glass items. We provided dixie cups, tape (A LOT of TAPE! ), scissors and marbles in addition to the recyclables. I made a small sample marble run, but otherwise designs were left to the participants. This is always great fun and a wonderful family project for all ages. I think an interesting challenge would be to try to connect all of the marble runs together to make a giant one! One of my favorite activities of the evening was investigating symmetry and angles by making popsicle/craft stick snowflakes. I give full credit to the blog: Relentlessly Fun, Deceptively Educational and the post: "It's Snowing Angles" for this great idea. We provided craft sticks, some images and information about actual snowflakes, protractors, and floor space. The kids went to town and created some beautiful designs. Snowflakes may not be what you are thinking about this time of year, but this is a fun math exercise with lovely results! We had an additional snowflake building room with hot glue guns that was not as successful. The intention was that students would be able to take their creations home, but it turns out the more simple solution of building giant ones on the floor was more engaging, safer and had better results! I'd recommend going that route! 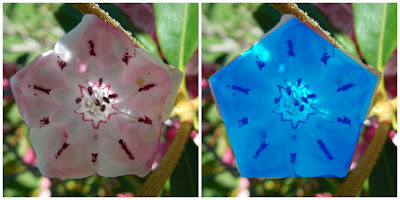 For excellent science information on snowflakes, check out: The Official Snowflake Bentley website and SnowCrystals.com. I love bubble painting! There are so many math and science concepts inherent in the study of bubbles. Check out some of them here. From angles, to surface tension there is a lot to learn. We used plastic wash basins for our bubble paint solution. Each kid or parent got a straw to blow bubbles in the solution and then placed a piece of cardstock onto the bubbles. They flipped it over, popped the bubbles and had a beautiful picture! An FYI: The neon colored tempera paint I had purchased was not dark enough to make good images, so we added some darker colors. I also recommend making a bubble solution with some corn syrup in it for stronger, stickier bubbles. There are lots of links to bubble recipes on my post "Bubble Fun!". For a more detailed explanation of bubble painting visit this Education.com page or just Google "Bubble painting" and you will find lots of options. Our biology students helped one of my science teaching colleagues demonstrate fruit DNA extraction for families. In addition to seeing fruit DNA families created a huge double helix model made from fuzzy craft sticks (aka pipe cleaners...although I guess it's not ok to call them that anymore...). Each nitrogenous base had a corresponding color so that students could accurately make up the base pairs. The model made it from the floor to the ceiling! To learn how you can extract DNA check out "Extract DNA with Stuff you Have at Home". For lots of ideas on building DNA models visit this Pinterest board. If you are a science educator who'd like to host a Family Science Night at your school, I'd be happy to field questions about our event. Feel free to e-mail me at shareitscience@gmail.com We were fortunate to have the support of our administration, lots of volunteer help from fellow teachers the night of the event and an interested and engaged community to participate in order to make this event a success.You could also simply have a family science night for your own family right at home! Thanks for exploring STEM plus Art with me today! I'm excited to wrap up our STEAM festival tomorrow with a closer look at math and science. To review our schedule and find links to all of the festival posts, click the Children's STEAM Festival button below. 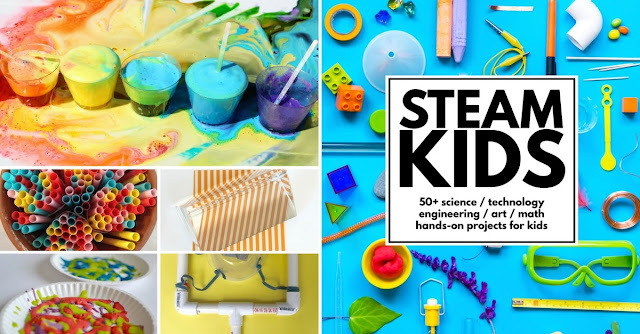 Looking for more STEAM projects for home, school or camp? Check out this great resource! 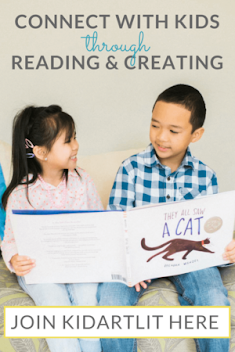 Read my review and learn more about STEAM Kids here. Children's STEAM Festival: Rube Goldberg Machines- an Engineering Challenge! It is Day 3 of the Children's STEAM Festival and today we are taking a closer look at ENGINEERING! Read on to find out how you can engineer your own Rube Goldberg contraption and then be sure to visit Growing With Science where Roberta has some interesting Engineering Activities for Kids to share. Engineering has to do with designing and building using engines, machines and structures. Engineering challenges are an engaging way to bring science concepts to life and encourage critical thinking and problem solving. Challenging children to build Rube Goldberg machines is a particularly exciting engineering task. Rube Goldberg was an engineer and a Pulitzer Prize winning cartoonist in the early 1900's. He is well known, amongst other things, for his drawings of wacky, complicated machines that accomplish simple tasks. Building a Rube Goldberg machine is a great engineering challenge because you can leave it as open-ended or as structured as you like. At school I've tasked kids with building machines that include a certain number of simple machines and a minimum and maximum number of steps. I've challenged them to pour water into a cup, squirt toothpaste out of a tube and pop a balloon. As far as materials go, the sky is the limit. I've had students choose to use things from everyday recyclables to the science room's skeleton model and a skateboard! This is a great summertime activity. Draw a blueprint and then amend it through trial and error. What scientific principles will you put to use? Gravity? Equal and opposite forces? Make a hypothesis on how certain aspects will work. Test it out! This is the scientific method in practice! Possible supplies: dominoes, popsicle sticks, k'nex or legos, blocks, marbles, small pulleys, string, toys, cardboard tubes, boxes, empty cans (watch out for sharp edges! ), etc. etc.! The official Rube Goldberg Machine Contest challenge for 2016 is to open an umbrella. Are you up for that challenge? There are a variety of age levels of the contest (11-18+), live and online. Find out more here. What task will your Rube Goldberg Machine accomplish? What supplies did you use? Did you make a cool video? Please share! You can add a comment in the comment section or comment on the Children's STEAM Festival posts on Facebook or Google+. Thanks for exploring engineering with me today! I'm looking forward to sharing STEAM ideas with you all week! To review our schedule and find links to all of the festival posts, click the Children's STEAM Festival button below. It is Day 2 of the Children's STEAM Festival, and today we're focusing on TECHNOLOGY! Read on to find excellent resources for coding, making and robotics in addition to some technology activities kids can try at home. Then pop on over to Growing with Science where Roberta will take you to a high-tech fashion show and give some ideas on how to make your own high-tech clothes. What do think of when you hear the world technology? Gadgets and gizmos? Words like digital and internet may come to mind. Although we are surrounded by technology in the digital gadget sense, if you look at the definition of technology, you may find other meanings. Technology: the use of science in industry, engineering, etc., to invent useful things or to solve problems. A machine, piece of equipment, method, etc., that is created by technology. Technology doesn't have to mean digital- simple machines like the wheel and axle and inclined plane are technology. Anything that helps us to solve problems can be a type of technology. There are many opportunities available for kids to put their problem-solving skills to the test while using technology. The movements to teach kids to code, make and engineer are propelling the need for skills that require an understanding of digital technology to create. 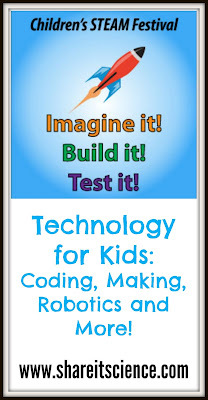 Let's explore some resources for coding, making and robotics and wrap it all up with some fun technology activities. There are many great resources for getting students involved in computer coding. Coding can teach skills that not only help and inspire students to create digital products, but also to model science projects, interface with hardware and create art. Although I am a huge advocate for getting children outside and reducing screen time, coding is a great way to promote sequencing and patterning skills and inspire creativity for those moments when children are plugged in. Code.org is a great resource for introducing kids to coding. Free courses are for all ages, including early elementary. At Code Studio you can find all sorts of coding lessons. In addition to the digital learning aspects there are also "unplugged" activities that get kids moving and completing tasks away from the computer. Code.org is behind The Hour of Code. The Hour of Code is an international event meant to introduce all ages to computer science and to help spread the word that learning to code is possible for anyone. To learn how you or your school can participate, visit their website. Tynker.com is fee-based online coding course. Students learn to create and can share their creations. You can check the STEM projects out here. They have a free starter lesson plans for teachers. This article at Edutopia reviews some wonderful, FREE, coding apps for a variety of ages. Code for Kids is a Canadian program with many resources available as well. Technology like the availability of 3D printers has brought the maker movement to new, exciting levels. Making and inventing are really where technology and engineering (tomorrow's STEAM festival topic) come together. Techopedia defines the maker movement as "a trend in which individuals or groups of individuals create and market products that are recreated and assembled using unused, discarded or broken electronic, plastic, silicon, or virtually any raw material and/or computer related device." Makerspaces are popping up in libraries and community centers. These are spaces where kids and adults have access to technology and tools that they can use to make an innovate. You can use the Maker Ed directory to find makerspaces and making events and opportunities in your area. This directory is powered by The Connectory which is a directory for finding STEM opportunities. Both are worth investigating further! Maker Ed's website also has a bank of resources and project ideas. Maker Kids is a Canadian based organization that teaches kids and educators 3D printing, electronics, woodworking, robotics, etc. You will find lots of great ideas and resources here as well. Make magazine and their blog and website are chock full of projects and inspiration from other makers. If you are looking for a project idea for this summer, this should be one of your first stops! Although setting up a dream makerspace can run into a lot of money, there are more and more affordable options and initiatives to get tools and technology into the hands of schools and groups who are inspiring innovators. Makerbot Education is a great place to start. Right now Inventables is running a contest to get a 3D carver into every state, with hopes to have them in every school by the end of the decade. You can apply to win one for your school here. A great at-home bit of technology available for making and creating are littleBits. (affiliate link) littleBits are electronic components that can be used to essentially invent anything. These would be a great gift for the inventor in your life. Take a peek at their project gallery to see some of the possibilities! *8/25/2015 Edit: littleBits is having a great back to school sale! 15% off everything- check it out here! The use of robotic technology increases student's understanding of science and allows them to engineer machines that can accomplish specific tasks. Robotic competitions have been building kids skills in teamwork and critical thinking for years. If you are interested in becoming involved in robotics or competition, you'll want to check out the U.S. FIRST Robotics competition for 9th-12th graders. Inventor Dean Kamen began FIRST in 1989. His mission was to help young people discover the rewards and excitement of science and technology. This program has grown to add Lego Leagues for younger age groups. Lego Mindstorms robotic kits are used in these competitions and can be purchased for building and programming robots at home as well. Try the activity "Passion for Pixels" from the PBS's SciGirls. Click "Download" under the picture on the left. After learning about digital images and pixels, kids can "transmit" images to each other on graph paper. No computer needed! This activity models how remote-sensing satellites take images from space, turn the images into digital information, which is then transmitted back to Earth where computer programs reconstruct the numbers and codes back into a visual image. "Electric Messages: Then and Now" is an activity from Try Engineering where kids can investigate how new technology has changed the way we communicate. Kids build a simple telegraph machine (using a battery, wire and a light bulb) where they can learn about communicating with Morse code. How is this different than how we communicate today? What were some of the challenges or benefits? Learn to Code: What Code Should You Learn? Thanks for exploring technology with me today! I'm looking forward to sharing STEAM ideas with you all week! To review our schedule and find links to all of the festival posts, click the Children's STEAM Festival button below. 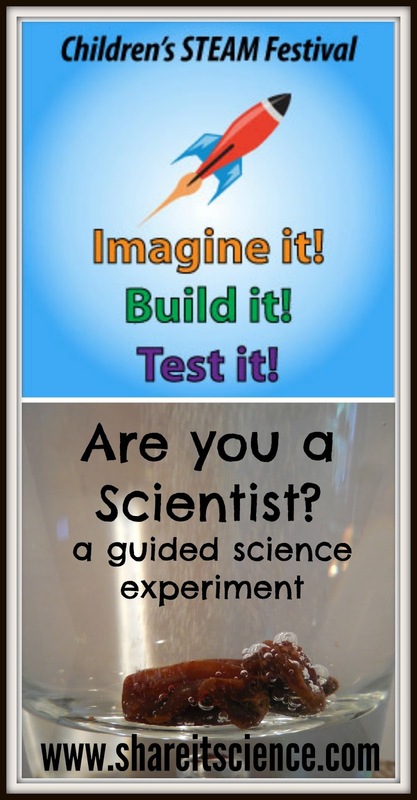 Children's STEAM Festival: Are You a Scientist? Welcome to Day 1 of the Children's STEAM Festival! STEAM stands for Science, Technology, Engineering, Art and Math. I'm so excited to be teaming up with Growing with Science each day this week to bring you activities exploring STEAM. Today we are focusing on SCIENCE! 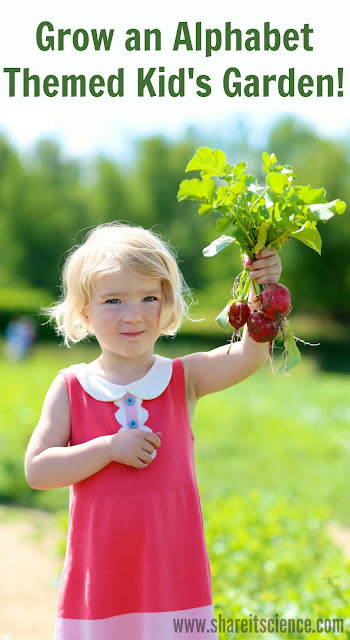 Read on for a guided science investigation to try at home, then hop on over to Growing with Science to explore the scientific method with some fun plant science activities. Are you a scientist? What is a scientist anyway? According to the dictionary, a scientist is "a person skilled in science; a science investigator". Ok, so what is science then? "The intellectual and practical activity encompassing the systematic study of the structure and behavior of the physical and natural world through observation and experiment." Whew! So what does that mean exactly? Translation: observing and experimenting to think and learn about the world around you. Ok, that makes more sense! So, are you a scientist? Do you wonder things? Do you observe your world? Do you experiment or research to find out the answer to things you are curious about? Then, yes! You are a scientist! In the picture book, "What Is A Scientist ?" by Barbara Lehn, (affiliate link) we find out that children are scientists just like grown-ups. They notice details, make predictions, design experiments and keep on trying even if something does not work the first time. Using this book as a guide, let's be scientists today! I was drinking a glass of seltzer water the other day and observed that the bubbles travel from the bottom of the glass to the top of the glass and then pop, making a fizzy sound. I wondered if other things travel upwards in fizzy, carbonated beverages, or if they just sink. I want to create an experiment to find out. I have raisins in the cupboard. I will try those! I predict that the raisins will sink. So, my hypothesis is that the raisins will sink to the bottom and I won't notice a difference in the seltzer. I am going to write down the steps of my experiment so I don't forget what I did. I also will draw some pictures so I can show others what I observed. Try the experiment with me! I know from reading "What Is A Scientist ?" that "A scientist writes about what happens." and "A scientist draws what she sees." So I set up my scientific notebook. I fill a glass with seltzer and observe the bubbles floating to the top. I drop in 5 raisins. I notice that the raisins sink. Noticing details is an important part of being a scientist. I wait. I also notice that bubbles are sticking to the raisins. Sometimes when you are being a scientist you have to be patient. All of a sudden something surprising happens! The raisin with the most bubbles floats to the top. Some of the bubbles pop and the raisin sinks. This begins to happen over and over. I write down my observations. Now I have so many questions. A good experiment always leads to new and interesting questions. How come the bubbles stick to the raisins? How long will the raisins "dance" and bounce for? Will other small items do the same thing? How come some of the raisins bounce more often than others? Does it matter that the seltzer I am using is flavored? Will this work if I used more than 5 raisins? Would the same thing happen if the seltzer was colder or warmer? What if I opened the seltzer and waited a while before I put the raisins in? What questions do you have? There is so much more to find out! Each of my questions could lead to a new experiment. It says in "What Is A Scientist ?" that "A scientist is a person who asks questions and tries different ways to answer them." It also says that "A scientist makes comparisons by measuring." I think I will test another item in the same amount of seltzer and see what happens. I have some popcorn in my cupboard too, so let's try that. I predict that the popcorn will drop and then float up to the top, just like the bubbles and the raisins. I add 5 popcorn kernels to a new glass of seltzer. I make my observations and take careful notes. Bubbles stick to the popcorn, but it stays close to the top! The popcorn does not sink. Now I have a new question. I am wondering if popcorn is not dense enough to sink. I want to know if the popcorn will float in plain tap water. I predict that it will float. I test it out. I observe that...the popcorn sinks! Hmmm, that was unexpected! I could be doing science experiments all day to figure this out! Two of the most important lessons I learned in "What Is A Scientist ?" are: "A scientist experiments by trial and error." and "A scientist keeps trying over and over." I will continue my experimentation. What did you find out? What new questions do you have? I can think of all sorts of other things to test in carbonated water- pasta, corn, lentils, dried beans, paper, paperclips... what else would you like to test? I want to hear about your experiment! Comment below or on Google+, Facebook or Pinterest. Once you have experimented, you can always research to find out the scientific principle behind what is happening. I like to look at books and use the internet. I'll give you a hint for your research- this experiment has to do with buoyancy and density. Thanks for being a scientist with me today! I'm looking forward to sharing STEAM ideas with you all week! To review our schedule click the Children's STEAM Festival button below. Got Science? These Non-Profit Organizations Do! Glimpse of the Garden: Week 11, Tortoise Beetles! Do You Love to Laugh? It Might be Genetic!